Danny Graber Photography A regatta, or boat race, is typically broken into three different fleets – gold, silver and bronze. Each fleet races individually, with 30 to 50 boats on the ice. In an average race, the iceboats will go around a one-mile course three times, going 35 to 50 mph, with each race lasting 10 to 15 minutes. Courtesy Rick Lemberg, 68, of Syracuse finished 17th out of the 27 boats in the silver fleet at the DN North American National Championship on Lake Wawasee in February. Danny Graber Photography The International DN Ice Yacht Racing Association was formed in Michigan in 1962, with its goal being to promote, protect and perpetuate DN one design iceboating and to advance the art and skill of the DN ice yacht construction and sailing. Since then, the association has grown to about 400 members within North America. There has also been a strong interest in Europe, with 18 countries forming the European association. Danny Graber Photography This year’s DN North American National Championships, which was supposed to happen on Indian Lake in Ohio, wasmoved 140 miles to Lake Wawasee. The championship, held on Feb. 21-23, welcomed about 100 iceboats from over eight countries. 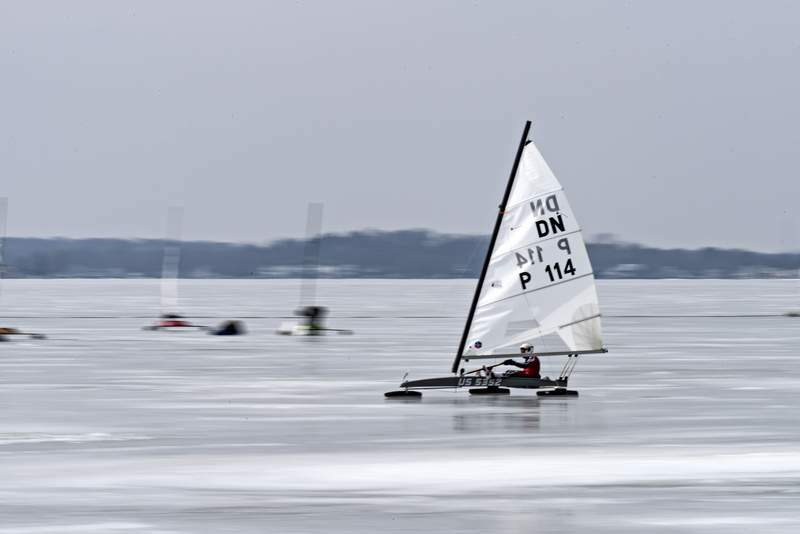 When Rick Lemberg moved from Chicago to Syracuse, he was asked by his friends on Lake Wawasee if he had ever tried ice sailing. It was the most expensive boat ride he ever took. Now 68, Lemberg is the owner of many boats, including his DN ice yacht, which he races with as many as 50 other sailors at a given time. The race came to him last month, when the DN North American National Championship moved from Lake Indian in Ohio to Lake Wawasee. While there are few who brave the cold to run an ice yacht into winds reaching 25 mph, the sport has been around since the late 19th century. The DN ice yacht, now one of the most popular iceboats in the world, got its start in 1937, when its design won a contest sponsored by the Detroit News. The newspaper opened its facility to 50 builders that same year, and the first fleet of DN iceboats, the Blue Streak 60, were assembled. Before the creation of the new boat, most out on the ice were stern steerers. Extremely heavy, they required two or three people to sail. Before automobiles, these boats needed to be transported by train. This new design, which was light and easy to disassemble and transport, allowed for sailors to go solo out on the lakes in search of the best ice. By 1962, the International DN Ice Yacht Racing Association was formed in Michigan with the goal to promote, protect and perpetuate DN one design iceboating and to advance the art and skill of the DN ice yacht construction and sailing. Since then, the association has grown to about 400 members in North America. There has also been a strong interest in Europe, with 18 countries forming a European association. Deb Whitehorse, secretary of the North America association, said ice yacht racing takes a special type of person. Whitehorse said flexibility is something that just comes along with the sport, especially since the racetrack is made of ice and can deteriorate within hours if it becomes too warm or if snow blows in. That's exactly what happened during this year's DN North American National Championship, which was supposed to happen on Indian Lake. 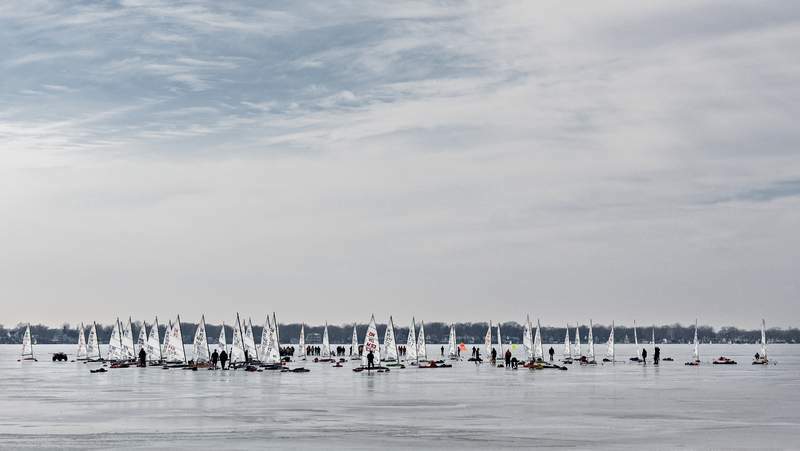 However, because of snow on the lake, the sailors packed up their boats and traveled 140 miles to Lake Wawasee. The championship, held Feb. 21-23, welcomed about 100 iceboats from several countries. A regatta, or boat race, is typically broken into three different fleets – gold, silver and bronze. “A new sailor would start out in the bronze fleet, and if they have a good result in the bronze league, they will qualify up to silver, and so forth,” Whitehorse said. Lemberg woke up at 9 that morning, an hour before the race, and headed to the ice for the skippers meeting, which is where officials go over ice safety and rule changes. Each fleet races individually, with 30 to 50 boats on the ice. In an average race, the iceboats will go around a one-mile course three times, going 35 to 50 mph, with each race lasting 10 to 15 minutes. Lemberg said wind is the hardest part of the sport. Before a race, he'll pre-sail the course and try to come up with a strategy once he knows where the winds might be. Lemberg finished 17th out of the 27 boats in the silver fleet at the national championship. His racing partner, Andy Allen, who also lives in Syracuse, placed 14th. 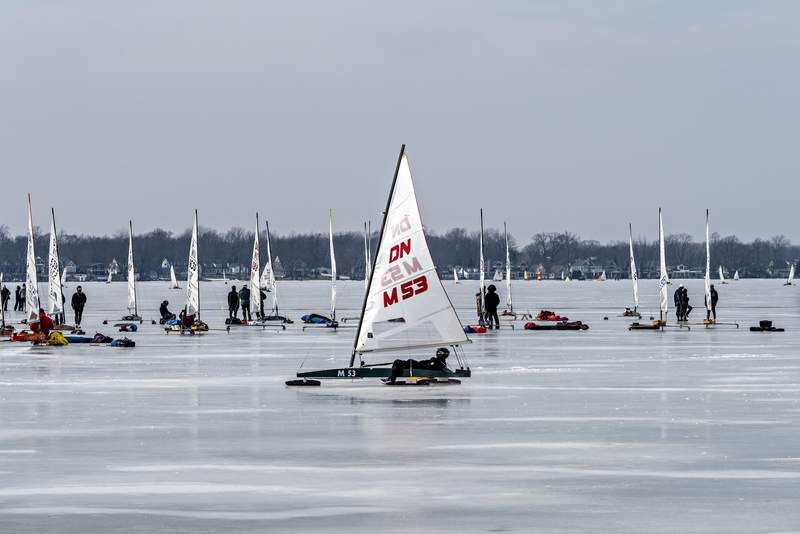 With winter ending and ice beginning to melt in the Great Lakes region, few regattas remain. 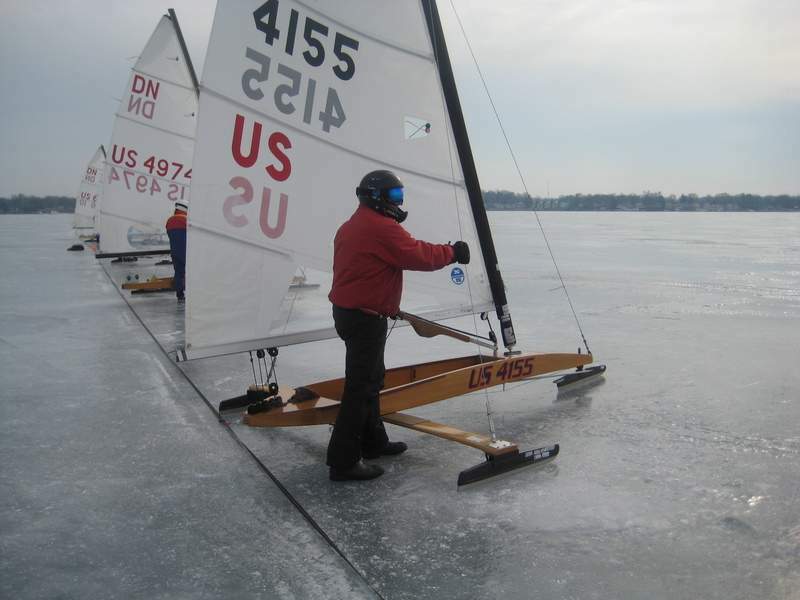 While Lemberg has been ice sailing for almost four decades, he can't wait for Lake Wawasee to ice over again.